Rochester Knighthawks fans knew it wasn’t going to be an ordinary night when Sid Smith opened the scoring just 22 seconds into the game. Smith’s goal sparked a 10-goal first half and the defense limited the Colorado Mammoth to a season-low five goals in a 14-5 win tonight. 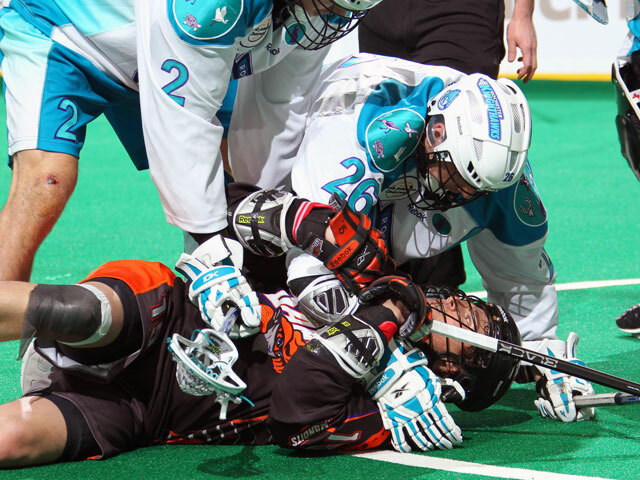 With the victory, the Knighthawks locked up a berth in the 2015 Champion’s Cup Playoffs. Vinc stood tall in goal for the Knighthawks, making 29 saves and allowing just one second-half goal. In fact, the Rochester defense blanked the Mammoth offense for over 41 minutes. Rochester has now limited its opponents to just 14 goals over the last three games. Dan Dawson, who collected his 1,100th career point, led the way with six points (1+5). He became one of seven players in the National Lacrosse League to achieve the milestone. Stephen Keogh scored a season-high four goals, while Jordan Hall, Joe Resetarits and Craig Point each added a goal and two assists. Cody Jamieson had a two point night (1+1) and Joe Walters, Sid Smith and Scott Campbell collected goals in the win. With an assist on Smith’s goal, Jamieson earned his 400th career point. Keogh connected over six minutes later, which sparked a 4-0 run. Hall then made it 3-0 just 10 minutes into the matchup. Point cashed in to give the Knighthawks their fourth goal before Colorado got two quick ones to make it 4-2 going into the second. Colorado made it a one-goal game early in the second, but that’s as close as they would get. Rochester broke open the game, scoring the next nine goals. Dawson’s first of the game came as he dove across the crease and the ball bounced through the five-hole of Dillon Ward. The Knighthawks continued on their run with goals from Walters, Keogh, Jamieson and Sullivan to close out the half with a 10-4 lead. Scoring slowed down for the second half, while the defense and Vinc took charge, blocking shot after shot. Keogh cashed in on the lone third-quarter goal to complete the hat trick at 3:59 of the third. Keogh put up a highlight-reel goal that again beat Ward 7:20 into the final quarter. Campbell’s goal came just 13 seconds later to give the Knighthawks a 10-goal lead, the largest of the night. Vinc held the Mammoth scoreless for nearly 28 minutes in the second half. The Knighthawks will be heading out west for a two-game weekend, starting in Colorado on Friday, April 17th. The team will then head to Vancouver the next night to take on the Stealth.